We really liked our room and the garden are. It looks exactly as showen on the photos. Very nice and calm area. There were many things in the property to consider: 1- Silence. No noise of cars or animals (at least during the 3 days we were there) 2- Environment. Surrounded by pines, when waking up, can open the window and door and see the nature, listen the birds, etc. 3- The room was really great. Clean, spacious, nice shower (hot water running very well), and many utilities that we did not use. 4- Did not feel crowded. We felt like whether it was our own house. 5- At least our bedroom had like a little terrace a bench to enjoy the stars and a little table to enjoy some breakfast or take-away food. 6- Bed was really confortable. 7- The room has some heater system (radiating floor), that works really well, although we did not use it. Nice styled bungalow like shown on the photos. Liked the ethnic bathroom. We were very pleased to discover the sense of peace you had in the bungalow! We slept perfecly and couldn't hear any noise from the outside! Nice private location but still close to San Antonio (with car). Lovely gardens all around the site and nice private pool area. Friendly host, flexible in check-in and check-out timings, cleaning was done 3 times a week, accommodation is as described and visible on the pictures. I loved the location, the bungalow, the air conditioning, the sleep I got. The swimming pool. Felt very safe a peaceful. Swimming pool. Man who greeted us was welcoming and friendly but we did not see him again. La habitación es espectacular, mejor que en la fotos y con todos los servicio disponibles. Susana muy atenta y agradable, volveremos a repetir. P.D: El descanso es absoluto, se caracteriza por su silencio. Lock in a great price for Can Vistabella Boutique Resort – rated 8.1 by recent guests! One of our best sellers in San Antonio! Set within gardens, Can Vistabella Boutique Resort features a swimming pool surrounded by a sun terrace and loungers. All accommodations features a terrace and free WiFi. Free parking is available on-site. Can Vistabella Boutique Resort is located up on a hill, with views over Portmany Bay and is a short drive to the beach. Rooms include coffee maker, fridge, and kettle. Some rooms include a flat-screen TV in the living room, which leads to the terrace; and a kitchen fitted with electric cooker and toaster. Bungalows offer a lounge-dining room with double sofa bed. Other facilities at the property include a restaurant and bar, located by the pool. A yoga deck and outdoor cinema are also available to guests. Ibiza Airport is approximately 14 mi from Can Vistabella Boutique Resort. Many bars and restaurants as well as popular clubs are a 5-minute drive away. When would you like to stay at Can Vistabella Boutique Resort? This air-conditioned bungalow features a private terrace and 1 double bedroom. A flat-screen Smart TV is also available. Set on the top floor, this suite features a terrace with panoramic views of the sea. It offers a fireplace and 1 bathroom with a shower and free toiletries. A kitchenette with a mini fridge, coffee machine, kettle, and toaster is also available. Featuring a private terrace, this room includes a small fridge, coffee machine, kettle, and toaster. The bathroom comes with free toiletries and shower. Located next to the pool, this double room features a flat-screen TV and a bathroom with shower. A kitchenette including kitchenware and utensils is available. This room features a flat-screen TV and a kitchenette. The bathroom comes with a shower. Unique rooms and apartments scattered around the Mediterranean gardens of Benimusa district that offer the best of comfort and relaxation at all times. It is the perfect choice for couples and families, to enjoy tranquillity and peace amongst the hubris of Ibiza. Our rooms feature everything for your ideal stay. 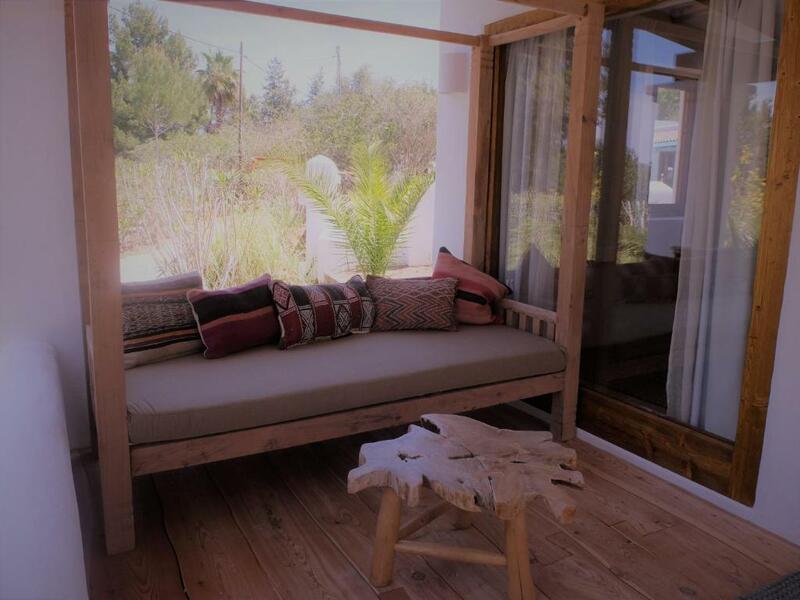 Designed with luxurious traditional Ibizan style and contemporary furniture for our guests' satisfaction. Each room has a private terrace that offers you and your family personalised space and service. Situated on 15,000 meters of mature private land, Can Vistabella will leave you with a feeling you could stay forever. The property features a large swimming pool with a bar and restaurant, organic herb garden and a gardens where the nature is just a sweet distraction. Pets are allowed only upon request and for a fee. Max. weight 10 kg. Situated on the hills of Benimusa region with magnificent views of the western coast with the sunsets that will steal your heart. Can Vistabella is the perfect location to reach all the spots of the island. Drive to the airport or Ibiza town takes approximately 20 minutes. Currently undergoing complete upgrade. House Rules Can Vistabella Boutique Resort takes special requests – add in the next step! Can Vistabella Boutique Resort accepts these cards and reserves the right to temporarily hold an amount prior to arrival. Please note that guests will be required to present the credit card used to make the reservation upon check-in. The property will be undergoing renovations from Thu, Feb 28, 2019 until Sun, Jun 30, 2019. During this period, guests may experience some noise or light disturbances, and some hotel facilities and services may not be available. Just to put something here, there is a big rock in the entrance, so you have be a bit careful when you go out or in with the car. Not a big deal. No facility of a kitchen. This why I mainly booked. This is a fraud. A total rip-off. A electric kettle which didn't even function, a single electrical hotplate mini fridge that's all there was in the room. The garden is not looked after. Totally mudy. I slept in the room and found that during the night it was a bit too hot.. It was all good and value for money. Minor remarks: No WiFi in the accommodation; could use some little renovations inside and outside. I did not like the kitchen. Not enough utensils. No microwave.Toaster tripped the electrics. Not enough sharp knives. Plastic chairs and sun loungers were old and needed replaced. When I sat on a chair to read I fell back and scraped my shoulder against a wall. On further investigation the chair and other chairs had cracks. Lots of cats,smell of cat faeces outside apartment. No clean towel change or mid stay cleaning. 45min hot,dirty,dusty walk to shops,restaurants and beach or 10euro one way taxi ride. Sun bed cushions very stained. Children's pool long term out of use. Lack of information about what to do with rubbish etc. Lady owner unfriendly.